Only showing entries about dive shops from Sustainable Travel. View entries about dive shops from all Travellerspoint blogs. Gili T : overhyped or a true little paradise? Gili Trawangan, The bigger and more exciting Gili. A little group of three small islands of off the northwest corner of Lombok, Indonesia. Most people (and yes with most people I mean all age groups, not just young backpackers with a low budget) spending a holiday in Indonesia, especially Bali and/or Lombok, will not escape to elusive call of “The Gilis”. Not only because the guidebooks or travel agent or their own brief internet research of “The 10 best things to see in Indonesia” mention it but because as a westerner (Bule) you get hassled and shouted at, by the local folk trying to earn an extra buck with selling transportation, if you want to go to Gili tomorrow.. Really. Honestly. There’s no escaping it. So why not, right? Even if it wasn’t on your own list of things to see. There must be a reason why everybody goes to the Gilis right? At least that what I told myself. So why not check out. So I did. Basically you have the choice out of three, once you decided to go to the Gilis. First up is Gili Air, it’s the closest to Lombok’s mainland. It’s happening but quieter and maybe more midrange for accommodation and food, I had the feeling it’s more for families. Next is Gili Meno. Not that populated or built up at all, it’s also quite small, even more quiet but the beaches look awesome. Ideal for honeymoons. Then comes Gili Trawangan. Definitely the party island of the three. It’s not only the biggest, it’s also the most frequented by far. More than a hundred different kinds of accommodation from flash to budget, you name it.. you can find it on Gili T. If you want choice in accommodation and food, bars and music scenes… Even smoke(able)s and a certain kind of mushrooms are readily available. I can’t talk about the quality of those but it seems to make a certain kind of visitor happy. Because Gili T is bigger it also has more coastline. Trust me when I say it’s perfect place for walking, running, bicycling, swimming, snorkeling. Awesome snorkeling! Right of the beaches. All of the islands have this going for them by the way but I can only really speak of Trawangan as that’s where I spent most of my time. With our travel style, it being a strict budget and trying to do the right thing at the same time, it became again apparent to us, we had to take the local angle. We figured out the local recycling system and returned plastic water bottles and empty glass beer bottles to little markets or the people we were ‘homestaying’ with. We got change back and made it easier for them yet again to make an extra buck as well. We got all of our snacks and toiletries in the back markets (not the ones on the main road, where prices are three times as much) and bought fresh fruit and a local brand crackers as snacks and breakfast. Soooo cheap. Home stays during high season on Gili T are expensive. Just haggle your way into almost half the price, without breakfast (which usually isn’t that great anyways) you can get a substantial discount. We haven’t encountered less than 100.000 Rpi on Gili T (other places it is more easy to get cheaper for obvious reasons), but it shouldn’t cost you more than 150.000 either for a very decent place. Meaning big bed (for a couple), good working fan and clean spacious bathroom. This translates into 10-15 dollars for a cheap room on Gili T. You can find these in the village on the south east corner of the island. With eating local food and going to the market at night (where dishes shouldn’t cost more than 25.000 (2.5 dollars), this being a lot of food including meat or fish, which makes it more expensive if you go vegetarian it will be A hell of a LOT cheaper. Don’t forget this is a holiday destination for Indonesians as well and things are a lot more expensive on the Gilis. Beer is the most expensive bit of your daily budget, that’s what it came down to for us. You could get the really cheap mixed drinks in the bars and they will get you there but they are also extremely bad for you. It’s poison basically. It’s not even Arak (Rice liquor), it’s some weird fake vodka and whisky and rum, it’s just not good. My stomach didn’t agree with it, so I stuck to beer. If you don’t overdo it, you can handle Gili T on a budget very easily. What I, personally, liked the best about the Gilis was that there is no traffic. No hustle and bustle from scooters, minibuses and cars. No real noise. No pollution except for the dust the horse carts kick up while passing you. You have your choice of beaches and there’s some pretty damn good ones. Snorkeling (and-or diving) is a must in this liitle heaven on earth. But what about the parties and all those youngsters trashing the place you ask? There wasn’t really much of that going on, honestly. Choose your accommodation wisely (away from the mosque and away from the main street and bars) and you’re golden. 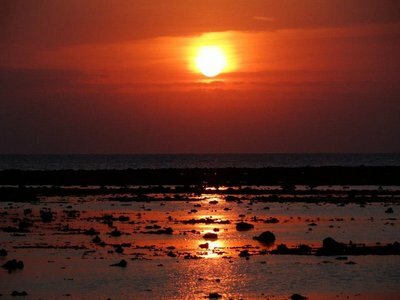 Go enjoy the magnificent sunsets every evening on the west coast, where the sun sets Gunung Agung (the highest volcanoe on Bali) on fire and have a two dollar big beer, while sitting on this beautiful white sand beach. It’s pretty magical. Do some snorkeling again the next day and some sunbathing, start a new book and go to the local Padang (restaurant with dishes on display) for a 5000 Rpi lunch, cause you figured out the system. That’s what locals pay for a portion of rice, sauce and vegies. Instead of going to yet another Indonesian run kitchen trying to make western sandwiches and burgers with chips for 50.000. Let’s just be honest, they are not good. Stick to what they know how to make and it will be a lot cheaper and a lot tastier. This is how the sustainable part of our travel comes in. Stay with locals, eat like the locals, buy food from the locals… feed the local economy. That is always the rule, wherever you go. Waste management is a problem in Indonesia. Plastic is everywhere. Creeks, rice fields, banana plantations, even in front of the house you’ll frequently see piles of half burnt plastic. Some people deal with it and clean, others just don’t. Keep the beaches and pristine waters clean, set a good example and pick up after yourself. The locals will appreciate it. Watch out with sunscreen use while snorkeling over the reefs. (It damages the reefs, you can get the ‘good’ kind.) Don’t touch the turtles or break anything of the reefs or stand on them And the most important one. Always haggle. Don’t let them get away with trying to charge you 5 times the price things should be. It’s how they do business, even amongst themselves. Just play the game. Once you got the hang of it, you’ll feel a lot better and more confident. It’s hard dealing with the knowledge they will always try to rip you off. Don’t take it personally, fight back. Always do the math in your head for any kind of payment and check how much change you got back. There always that 10 or 20.000 they’ll try and sneak in there to put in their own pocket. Wages are low and people have other ways of supporting their family. Enough said, not? You can haggle over everything. From rooms, snorkel trips to dinner and a bottle of water in a supermarket. They’ll try and make you feel like things have a set price, but they really don’t. Another big problem is people don’t seem to understand the locals are muslim. Which means dress appropriately. Especially while walking through the village. Don’t come running back from the beach in your bikini, like I saw one girl do one day. I’m sure you can understand what that would feel like for a local woman to see every day outside her house. Transportation to the Gilis can be easy, fast and expensive or hard and slow and very, very cheap. It’s however you feel about it. We took the cheap way and it worked out every time but it’s not the stress-free way for sure. I thought it was a pretty special place, but you have to treat it with respect and adapt to the locals. I can easily see the Gilis getting ruined by the highly increased interest in the last couple of years (some think it already is). It will only get worse and in my opinion it is already on the verge of being too much. So if you are planning to go to the Gilis or are doubting if you should, I didn’t regret it in the slightest bit. I had a wonderful time and thought the place was amazing!